This beautiful, washable rug will withstand dirt and stains with grace. Run it through the wash to clean it up and keep it looking like new. The bereber design is inspired by colorful, handmade rugs that originate in Northern Africa. But these rungs are handmade in India by artisans for fair wages using hypoallergenic cotton and all-natural, nontoxic dyes. 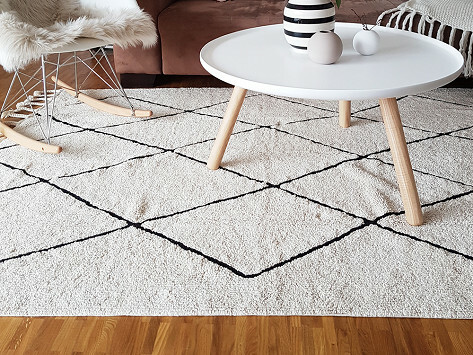 Here’s a rug that's meant to be walked over—and come out looking clean. 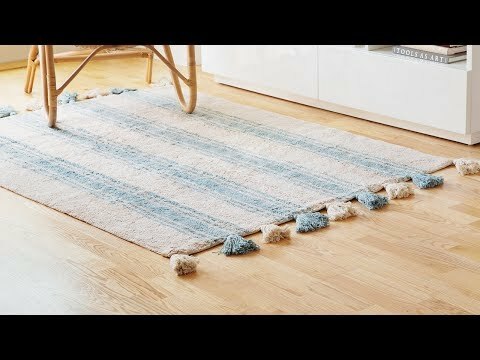 Lorena Canals washable rugs are soft, stylish, and easy to care for. Toss them in the wash to remove stains, dirt, and wear. They’ll stand up to encounters with kids, pets, spills and more. Each rug is handmade in India by artisans for fair wages. The artisans use hypoallergenic, eco-friendly cotton, and all-natural, nontoxic dyes to create rich colors and patterns. And for every rug that ends up in a home like yours, the folks at Lorena Canals fund a child’s schooling in northern India. Besides pulling together your living room, playroom, or dorm, these rugs can even function as a picnic blanket if you like. They’ll be dirt- and stain-free after a gentle cycle in the wash and low temperature spin in the dryer.